Our mission is to teach individuals in organizations, communities, schools, and on sports teams to have respectful interactions, to build cultural awareness, and to find common ground with individuals who are different from themselves. We do this by delivering programs, training resources, and communication tools. Founded in 2008, The Campaign was incorporated in October 2015 under the name Dignity & Respect, Inc. A collaborative initiative inspiring people around the world to treat each other with dignity and respect, the Campaign’s mission is to make our world a better place for ALL to live with ALL of our differences. We provide simple tools to help you Get Started. We offer D&R initiatives that help individuals and organizations get involved in creating environments for ALL to work, live, learn, and play—with ALL of our differences. We help you stay informed about our activities through our website, newsletter, blog, and social media. And, we recognize D&R Champions, individuals and organizations leading the way. In October of 2008, UPMC, a health care provider and insurer in Pittsburgh, introduced Dignity & Respect to its employees as an approach to encourage inclusion through behavioral and organizational change. During town halls in hospitals, clinics, and offices, employees were asked to describe “What happens in a workplace where people are treated with dignity and respect?” Common behaviors emerged, and these became the 30 Tips of Dignity & Respect. We created a Pledge as a way for employees to express their commitment to practicing these behaviors every day. A website was developed to host the Pledge and the 30 Tips. 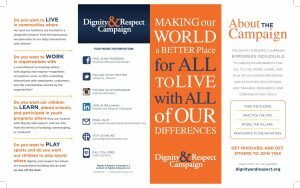 The Dignity & Respect Campaign was born! Since its inception we have continued to add additional tools and initiatives and made them available to others. What began as an internal initiative at UPMC, a health care provider and insurer in Pittsburgh, has become a Campaign inspiring people across the nation. 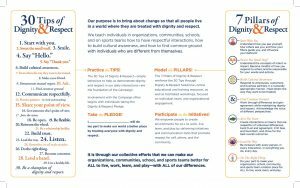 Today, more than 100 organizations, schools, and communities are engaged with the Dignity & Respect Campaign promoting dignity and respect for self, others, and communities. It is through our efforts that Campaign comes to life.